Several weeks ago I posted a picture of the menu planning page that I use each week. After sharing that picture I received several emails and comments asking where I got my menu planning notebook. My notebook is actually a notebook that I put together at the beginning of the year, but the planning page that I use for my menu in the notebook was one that a friend designed for me quite a few years ago and I love the overall layout of it. I could never find a menu planning page that I liked and this one has worked well for me because it was designed for me, but after using it for a few years, I wanted to change it up a little. I talked to my blog designer Joy about using the basic idea, but also changing it up some. And here is what she came up with. I love the new menu planning page she designed! It is simple and clean and contains just what I need it to. I love having a spot for a grocery list next to my menu plan. This works for me because as I plan my menu I can jot down the items I need for those recipes. This really helps if I am planning my menu a few weeks out. I use this spot mainly to write down perishable items like green peppers or tomatoes or sour cream that I need for the recipes that week, but you can easily use this for your whole grocery list. I love the fact that I can add whatever other items I need as I make my menu plan and then I can cut the list off of the menu page and take it to the store. This works well for me because it keeps it all in one place. For years I kept this menu page/grocery list on my refrigerator and that worked well. This last year I put it into my notebook planner and that seems to be working well for me for now. Now would you like to know how to get your own menu planning page to use each week? It is very easy! I am offering this menu planning page FREE to all my readers. Just click here to download free menu planning printable. Note: If your sheet does not look right when you print it, please try saving it to your computer and then print it from the saved versions. There have been some issues in some browsers and saving it first seems to solve this problem. 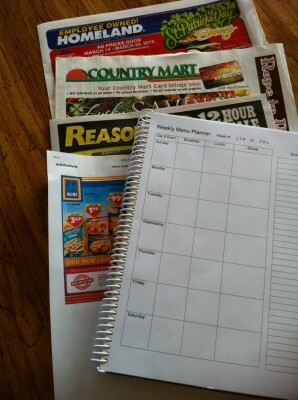 I hope that it inspires you and keeps you organized as you plan your menu each week. Enjoy! I like this sheet but when I printed it (a few times), the lines didn’t print out. All the words did as did the dots at each cross point and end point. Is this an issue on my side? I am guessing that it is an issue on your end because it is printing fine for others. Weird. I tried it from two printers in my house, at the library and then at a friend’s house and it did the same thing each time. I’ll keep trying because I really like it. Thanks for the reply! You are not the only one that has now mentioned this, so we are going to figure out what is going on and redo the sheet. I will let you know when it is fixed. Sorry about that. This is a great sheet! I am wondering if there is a way that I can make fields so I can TYPE my meal plan onto it, instead of write by hand. Does anyone know how to do this? Thank you for sharing this with your readers!! I don’t have a printed sheet I use yet … I just usually jot mine down on sticky notes and half the time misplace them. This looks great for planning and then like the shopping list there too. LOVE this!!!! Can’t wait to use it!!!! I like having a menu book to look back at for ideas when I can’t think of anything or so that I don’t repeat something too often. Thank you so much for sharing this! I’ve been looking for something that was nice and simple to use for menu planning and I think this just might be it. You are welcome! I hope you enjoy it. love this. 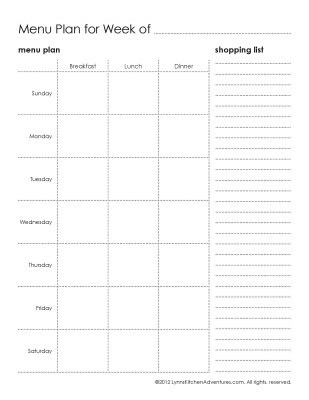 all the “weekly menu planners” i’ve found online until now really only included dinner, never found one that allowed for proper planning of all 3 meals. this is great. Thanks! I agree, I like to see them all on one plan. I hope you enjoy it. Thanks for this!!! I usually use a scrap piece of paper, this form will work much better! I always forget to add breakfast and lunch to my list, and then wonder why I can never stay on budget!